I’m on this kick lately because it seems with each passing day I find wildlife more exciting. I’m not a biologist or a zoologist, not even a naturalist. Mostly I’m a mom who thinks that it’s pretty darn neat that we humans are not much different than the things that live in our backyards or the animals we see in the zoo. I know this because I like to get together with my girl friends and drink coffee while the kids are in school and wine when they are in bed. All over the animal kingdom, animals are doing the same thing. Perhaps not drinking a latte and whining about the rising cost of preschool tuitions, but certainly hanging out with gal pals because they know to do none other. 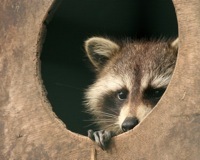 Consider the raccoon, terrorizer of campsites and garbage cans. These masked critters live in small groups of females unless they’re busy making babies. Or the coati, a raccoon-looking thing that appears mostly in zoos these days, who does the same thing. Coatis live in giant groups of all women, where they help raise each other’s young, keep each other clean, and all work together to find food and stay safe. Sounds like a big ol’ slumber party to me. My friends and I are really not much different. We babysit each other’s kids, and make each other food when one of us needs a little help. We’re there for each other if need be, and more than anything, we enjoy the fellowship of other women and moms like it was our job. As if we know no other way. Call it instinct, call it society. I’m calling it a mama party across the natural world, humans included. Although if I peek out my window one night to find a group of raccoons sipping a merlot on my back patio, I may start to worry. Bio: Karrie McAllister, Mamazina Magazine’s graphic designer and regular columnist, has dabbled in everything from coal mining to culinary classes. She and her family live in Northeast Ohio where conversations in the grocery store and pierogis are as common as Amish buggies. Her column, Small Town Soup, appears in local newspapers and she is published on a variety of Web sites. Read more at her blog, Mom, Writer, Dirt-lover at www.KarrieMcAllister.com.